This year’s 5-day long +ITB Berlin that concluded on March 9, 2014 sent out very positive signals for the international travel industry. In Germany consumers have ensured that the mood in the travel industry is positive. Backed by a stable employment market, good wage agreements and positive forecasts for economic growth, German citizens aim to spend more money on their holidays than in previous years. This year’s ITB Berlin reported a four per cent rise in trade visitors and an increase in business volume, which Messe Berlin estimates reached 6.5 billion euros. The focus of the world’s leading travel trade fair, which came to an end on March 9, was on travel bookings via smartphones and tablets and on sustainable practices in the travel industry. Nepal took centrestage of the South Asian pavilion with the stand decorated purely on Nepalese style. Among the top visitors visited Nepal’s stand were Mr. Jurgen Klimke, Member of Parliament, Bundestag, Germany, and Ms. Alessandro Rais, Dirigente Generale, Regional Minister of Tourism of Sicily. The Secretary of Culture, Tourism and Civil Aviation Mr. Sushil Ghimire and Acting CEO of Nepal Tourism Board Mr. Subash Nirola briefed them about the tourism of Nepal and requested them for mutual cooperation in tourism. 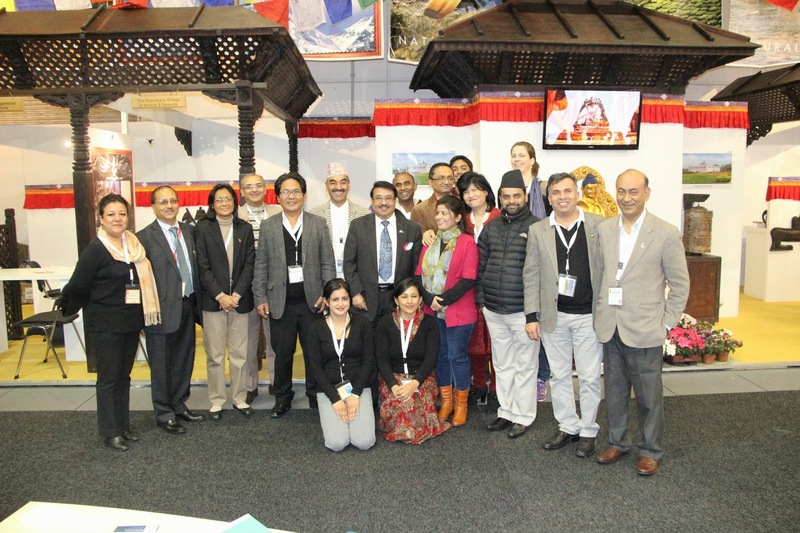 Altogether, 21 travel trade companies of Nepal actively participated the fair apart from Nepal Tourism Board and sold Nepal’s package to European visitors. On March 6, as a part of ITB Berlin’s highlight program, +Nepal Tourism Board organized Naturally Nepal program under the banner of Mt. Everest Diamond Jubilee celebration at ICC Hall, Messe Berlin amidst the presence of journalists, tour operators and Nepal lovers. On this occasion Mr. SushilGhimire, Secretary of Ministry of Culture, Tourism and Civil Aviation and Chairman of Nepal Tourism Board conferred the Mt. Everest Diamond Jubilee medal to Prof. Wolfgang Nairz, who led the expedition to Mt. Everest that placed Mr. ReinoldMerssner and Peter Habeler on the top of Everest without artificial oxygen in 1978. Prof. Wolfgang Nairz, in his address, thanked Sherpas for helping mountaineers to achieve their dream. “They are the real heroes. Nobody can climbed the Mt. Everest without their support,” he said. He further said,I have been to Nepal more than 80 times since 1970, and I feel at home when I visit Nepal.felt home in Nepal.” Prof. Nairz climbed Mt. Everest in 1978. During the event, Mr. Sesh Ghale, President of NRN International Coordination Committee, also committed to work for the promotion of Nepal’s tourism in more than 50 countries where the NRNs are based. Similarly, Mr. Dil Gurung, NTB’s Honorary PRR in Germany, spoke on the occasion highlighting Nepal as a destination for all seasons with its temperate and pleasant weather disposition. In its role as a think tank, the ITB Berlin Convention has become a firm fixture for trend scouts operating within the international travel industry. More than ever, Berlin is where innovative travel trends are shown. Luxury travel was a key topic that attracted keen visitor interest. From 5 to 9 March 2014, 10,147 exhibitors from 189 countries – more than two-thirds of whom came from abroad – were represented in 26 halls which were booked to capacity. Overall, out of 201,8000 visitors, s114,000 trade visitors made it to ITB Berlin. The ITB Berlin Convention registered record levels of attendance. A total of 22,000 took part in around 200 lectures, discussions and workshops, over 5 percent more than in 2013. Social Media and Mobile Travel Services proved to be major visitor attractions. Once again, the matchmaking event for bloggers and exhibitors met with an extremely positive response. Over a period of two days 2,000 events took place attended by 120 exhibitors and bloggers from 25 countries. Mexico, this year’s partner country, fascinated its visitors on the eve of ITB Berlin with a dazzling programme of entertainment and a fascinating multimedia show which highlighted its cultural treasures.